The formal title of the drawing states that the survey was conducted under the supervision of Robert Dawson. One of the best surveyors and draughtsmen of the day, Dawson was employed on the Ordnance Survey for over forty years, also working as an instructor. 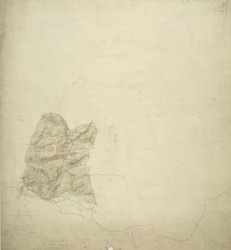 The scale of the drawing is noted and the area of the land recorded as 44.6825 square miles in total. Archaeological sites are named in gothic script. Colour washes depicting relief are combined with numerical annotations or spot heights giving the heights of the hills. Those in red ink indicate trigonometrically ascertained altitudes while those in black are estimated. The paper carries a watermark from the James Whatman Turkey Mill in Kent dated 1819.